It’s electrifying! The CW has renewed its Black Lightning TV show for a second season. The superhero series is based on the DC Comics of the same name from Tony Isabella. 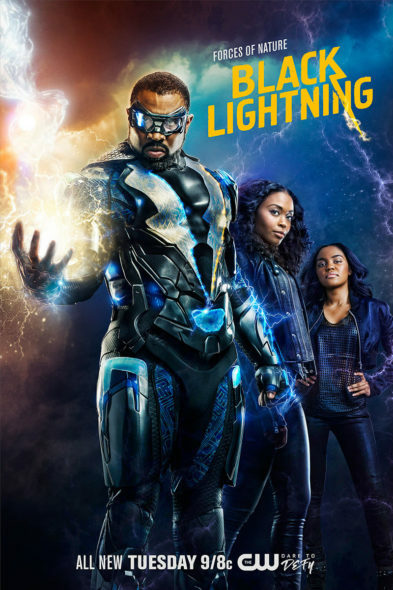 A CW action-adventure series, Black Lightning stars Cress Williams, Nafessa Williams, China Anne McClain, James Remar, Damon Gupton, Christine Adams, and Marvin Jones III. The story follows Jefferson Pierce (Williams), who has the ability to harness and control electricity. When the brutal gang, The One Hundred, seizes control of his city, Pierce returns to vigilantism, to fight crime. The first season of Black Lightning is averaging a 0.59 rating in the 18-49 demographic and 1.78 million viewers. When you check out Black Lightning‘s rankings among the scripted CW TV shows, it’s clear the renewal didn’t come out of the blue. What do you think Have you been watching DC’s Black Lightning TV series? Did you expect it to be cancelled or renewed for season two on The CW? BLACK LIGHTNING, GOOD START TO THE SHOW.!! HOPE YOU HAVE CROSS OVERS WITH THE FLASH & AND ARROW.?? ETC. Meh…as Tha Critic said this show became too focused on social commentary than the superhero. I’m surprised it was renewed…The Inhumans was more interesting. God forbid a black superhero that’s female. I agree a bit about the social commentary but they could show how he got his power and his daughters. Dia, don’t start that mess with me. If a show is called Black Lightning and that’s who the protagonist is, that’s who they should focusing on, especially when the show is NEW. And I’m black also and love women, so don’t even with that. No what a bad news. I just wanted to say that I just watched the whole season in 2 days and cannot WAIT for the next one. I thought every aspect of the show was informative, although a little exaggerated it dramatic at time, but it is a show. My favorite was the bond of the family. Amazing writing and soundtrack. Would LOVE to be a first star to meet the cast! Great job y’all!